The exhibition preview was held on Thursday 3 July.The Deputy Mayor of Marrickville, Councillor Rosana Tyler, introduced Mr Pawan Luthra who gave a thoughtful response to Ajay Sharma’s work. 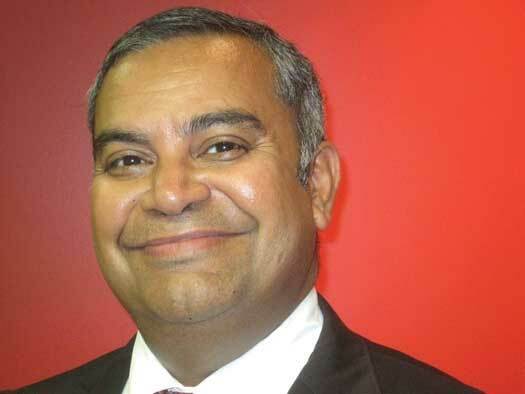 Pawan Luthra is the CEO of the Indian Link Media Group, which manages the Australia-wide Indian Link newspaper and the subscription-based Indian Link Radio. Pawan Luthra is a regular media commentator on various issues affecting the Indian Australian community. In 2014 he won Best Print Reporter at the NSW Premier Multicultural Media Awards and in 2012 he was awarded the Parliament of NSW Multicultural Journalist of the Year. In November 2012 he was involved on an expert panel moderated by Nell Schofield ‘Through Indian Eyes: A Hypothetical about Craft, Design, Heritage and Globalisation’ at the Powerhouse Museum, which addressed the revitalisation of dying art forms as future forms of creative expression. Deputy Mayor Councillor Rosana Tyler, Ajay Sharma, Sally Clarke, Brenda Factor and guests, thank you for inviting me today. Growing up in India, we were surrounded by many examples of miniature art. We had them in our homes and in our schools, and often on the walls at work also. It is a great pleasure for me to be here: something that was such an essential part of my childhood, is being appreciated in my new home. I have never been good at art myself, but as a child I would often wonder at how tedious and painstaking it must have been for the artist to create the paintings that hung in my hallway, and that my mum cherished so much. The margin of error seemed so narrow, and having no confidence in my own fine motor skills, I made up my mind fairly early that I would not enter a field in which my mistakes would be laid bare for easy scrutiny. 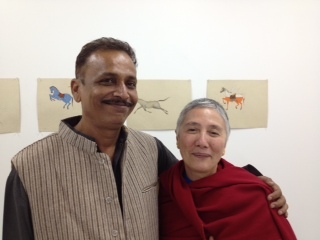 And so you will understand, what a privilege it has been for me to meet Ajay Sharma, India’s leading miniaturist. In a career spanning some 40 years, Ajay has devoted himself to keeping alive a centuries’ old tradition. As head of a studio of artists and students in Jaipur that was launched way back in 1984, he is involved in all aspects of the art form, including composition, drawing, conservation, copy work, in the research and preparation of pigments. He has some fascinating stories to tell about his art, not just the process in which he creates the wasli paper on which the works are made, but also of how in the early days, he made his own paintbrushes: he physically caught the squirrels to extract the fine hair from their tails. He will assure you though, that no squirrels were killed to make up the brushes that created these, or indeed any, of his works. Ajay has also been instrumental in taking the Rajasthani style of miniature art to some of the world’s leading art institutions, in the form of both exhibitions and workshops. Many non-Indian artists have now taken up the art form. Interestingly, the theme of his current exhibition, The Speed of Life, finds much parallel with his own life’s work. While he has dedicated his energies to conserving and perpetuating an age-old practice, he sees around him a world that is modernising at fast pace. The Speed of Life is a lament on the loss of traditions and family values, and an increasing disconnect with nature, that such modernisation and globalisation has brought in. The horse of course, has interesting symbolism. Representing a driving force that carries you through life, it is a symbol not only of life energy, but also of freedom of expression. As such, it turns out to be a perfect medium for Ajay. As an observer myself of trends in the psycho-social fabric of contemporary India, I do agree with Ajay. The change is quite tumultuous really, and like a tsunami sweeping across the land, it is leaving behind some debris in its aftermath. The particular social problems that have arisen in India recently and made headlines across the world, are an unfortunate side effect of this fast-paced change. I don’t want to bring a sombre note to tonight’s event, but I think this has a significant bearing on the works of art displayed here. They speak of the far-reaching psycho-social implications of rampant and unsustainable modernisation. Unlike Ajay however, I am a bit more optimistic about India’s youth. My own view is that as a developing country, India is going through an adolescence of sorts, struggling with issues of identity as it grapples with the notions of tradition vs modernisation. It’s going to be interesting to see how the ‘teenage’ India resolves this crisis, but at the end of it, it will evolve into unique selfhood. India will modernise – it must modernise. And just as Ajay’s particular passion has evolved through Persian, Islamic, Mughal, Rajput, even British, influences, and survived to tell its own tale as an amalgam of all these, yet an independent and innovative art form that can be used to cast a contemporary look on life, India will make it too– with its own particular mix of traditionalism and modernism. I thank Sally and Brenda in their vision of putting this exhibition together and sharing with all of this the talents of Ajay Sharma. 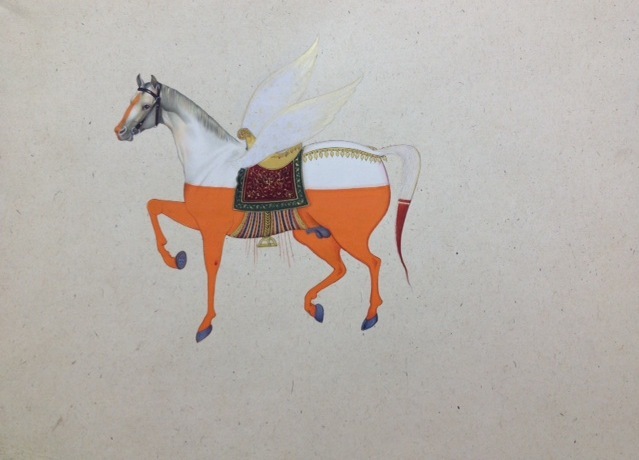 An article by Editor Rajni Anand Luthra about Ajay Sharma’s exhibition also appears in the Indian Link e-newsletter, All Dolled Up and Ready to Canter. Ajay Sharma with Francine Haywood who has undertaken Ajay Sharma’s Miniature Painting workshops in Jaipur and who introduced AirSpace Projects to the work of Ajay Sharma. 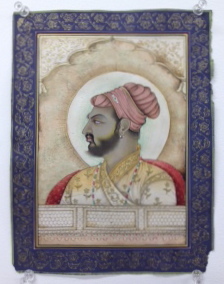 Ajay Sharma is a freelance artist and Master Mughal Miniature Painter of the Rajasthan School who has been supervising a studio of employees and students in Jaipur, India, since 1984. 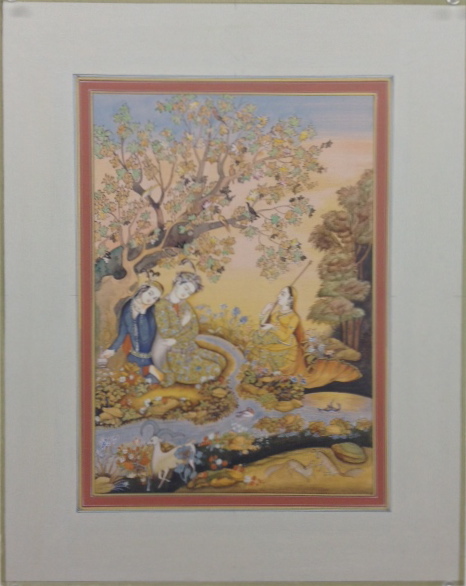 From 1979 until 1984 he was apprenticed under the direct tutelage of Master Painter Mahendra Sharma in Jaipur, India. 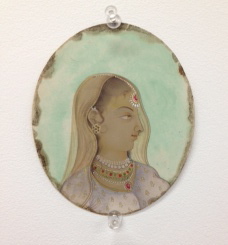 Sharma has built an international reputation based upon the many artists and students who have passed through his school and as a result of his teaching and exhibition history both in India and abroad. In 2010 he exhibited his collaborative works with artist Julie Evans in ‘Cowdust’ at the Julie Saul Gallery, New York. The exhibition received significant reviews in Art in America (Anna MeCugni, January 2011), Art Forum (Ida Panicelli, February 2011) and Vogue Italia (Emanuel, Lugli, November 2011). 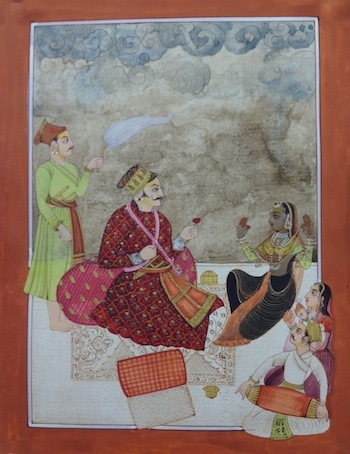 He has taught miniature painting at the Jaipur Virasat Foundation; the Virginia Commonwealth University in Doha; the University of Baroda; the Sanskriti Kendra in New Delhi; the Ahmadabad Fine Arts College; the Prince’s School of Traditional Arts in London; and demonstrated his techniques at the Department of Fine Arts, University of Connecticut in the United States. 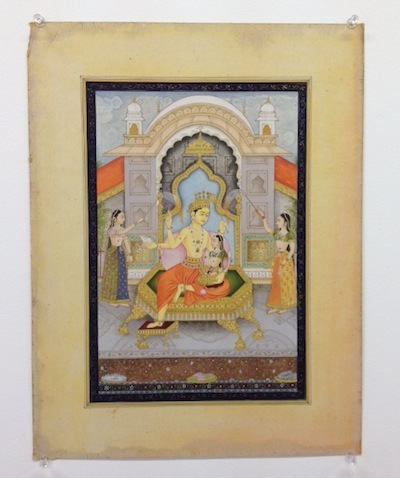 Indian Miniature Painting has a long and very significant tradition in India and Master Miniature Painter Ajay Sharma’s exhibition represents a number of these traditions and styles including: Mughal, Rajasthan and Deccan, as well as his original work. In this show Ajay Sharma takes his work as a painter to a new level with the series of six paintings, The Speed of Life. 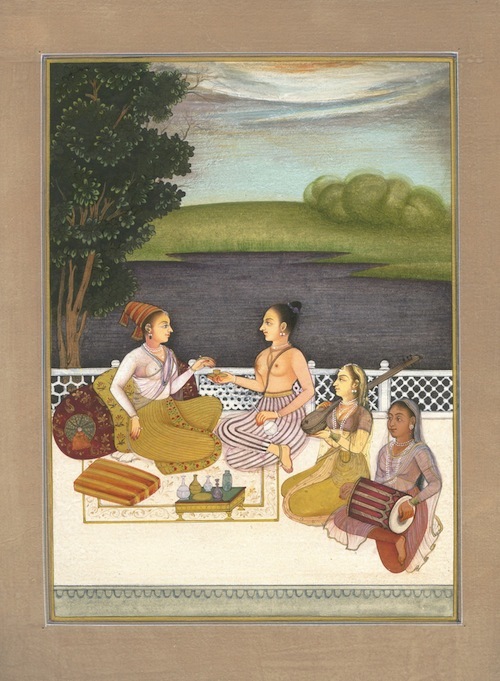 In this series Sharma reflects on the meeting point between tradition and the pace of modern life focusing on the theme of the life of a common man, which he sees as an important part of his life as well. Sharma has written a few lines in Hindi that presents the core emotion of this series. This next verse explains the story of the series further. Society, social value and social custom are never independent from humans, animals or nature (part of society), harmony among them all is called life. Nothing is eternal in this world as destruction leads to a new creation. Metamorphosis is a fact and so are values, social morals and customs. In other words, a new change comes with a fear of losing something, but when one persists in only following the old traditions, then new challenges will be lacking. The Speed of Life depicts changes in society. The horse symbol has a twofold meaning: the life of humans and the sense of what is left behind. 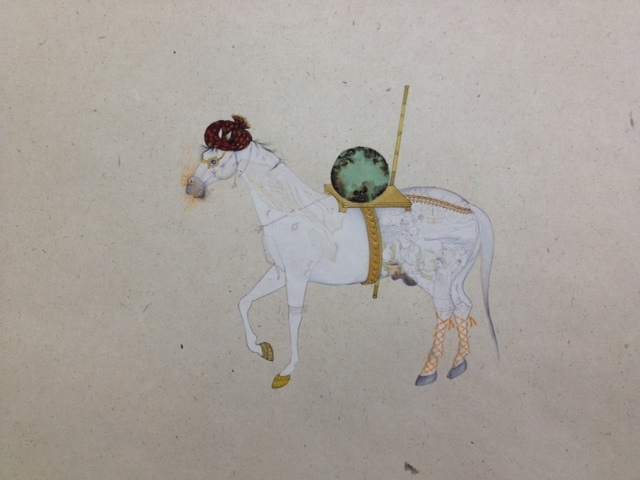 Fine Miniature work has been done in the back part of the horse’s image. At the same time, at the front, towards the face, the miniature work becomes dull. With prosperity and richness, nature fades as we move forward. In this entire series of paintings, each horse has two phases: the front symbolises the near future and the back symbolises our past. 1. Mother Nature (Impairment of Nature), 2014. Stone and natural pigments on paper, 30.5 x 40cm. This painting is a depiction of The Speed Of Life in the form of Mother Nature. Nature presents a drastic change in itself that is the core idea of this painting as well. A horse that is symbolising free flowing nature with strong stamina, at the same time it is losing his color and quality while moving forward. Green color and vegetation in the image of the horse is symbolising prosperity of Mother Nature. At the same time the front part that is moving forward is degrading with drastic changes due to negligence by humans. 2. Family (Fading Out of Joint Values), 2014. Stone and natural pigments, 30.5 x 40cm. Life Energy Horse is a Chieftain and he is balancing a globe on his back. The Chieftain is so good at balancing this globe that he doesn’t even need any support to keep it straight over his back. The Globe symbolises unity in the family and the turban over the head of horse symbolises his role as chieftain. A family is like a tree, all kinds of personalities live in a joint family and the chieftain takes care of them all, but nowadays there is a new phenomenon: there are more small and nuclear families than joint families. This painting is a depiction of this same phenomenon, of youngsters who are moving forward and no longer preferring to stay in joint families. Intricate miniature work has been shown on the back part of the horse, depicting humans, and animals all living together as a family at the same place. But while moving forward in the present and going towards the future, the front part of horse is much less detailed and doesn’t really have such richness in it. As a person living in a joint family, I believe more in joint families than nuclear families. 3. Tradition (Rights and Customs), 2004. Stone and natural pigments on paper, 30.5 x 40cm. This painting is dedicated to a one of its kind (social group) who wants to stand in this competitive world, but at the same time keep old traditions and beliefs. This horse symbolizes this kind of youths who want to follow tradition and feel satisfaction in doing it. Now this youth is tired, but yet he wants to be a part of the old tradition. 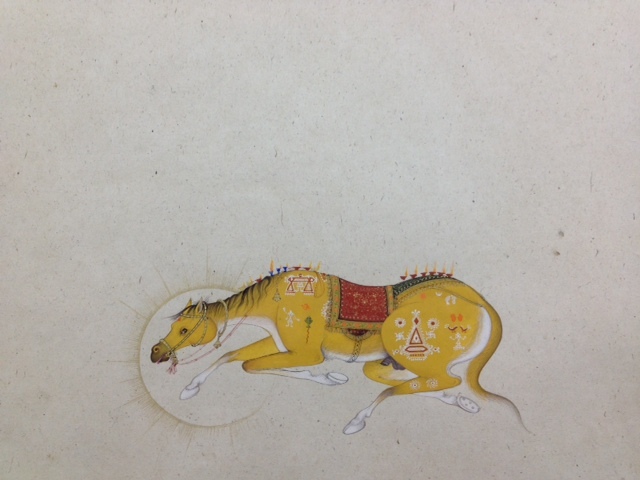 The image of this horse has many Indian Rangoli symbols on it; symbols which belong to rituals and ceremonies in traditional worship and festivals. Symbols of rangoli over the horse represent richness and his affection towards tradition. 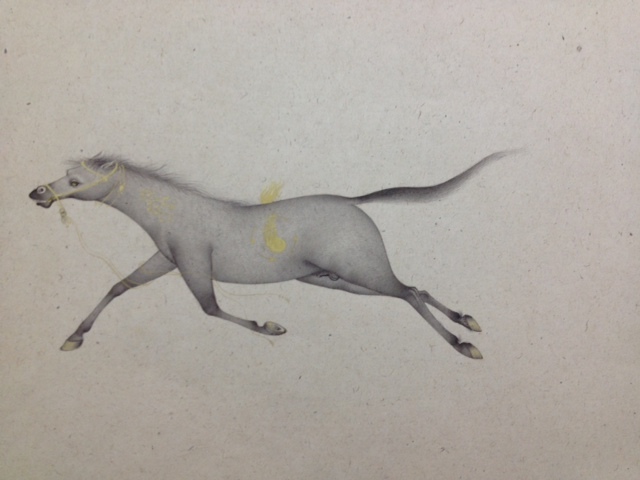 The horse is tired and cannot really continue with old traditional ways, so symbols are now fading towards his face. Morality: even if youths want to follow their old beliefs, they are not able to do it because nowadays they are too tired due to busy day-to-day life and rapidly increasing responsibilities. The truth is we are now all losing our traditions and customs. 4. Successful Youth (Youngsters and Guardians), 2014. Stone and natural pigments, 30.5 x 40cm. This horse symbolises a new generation of youths. Today every youth is worried about their carrier, job and other personal issues. The new generation has new thoughts; new ideas and they are working very well with them and successfully as well. While following new customs, youths have forgotten their tradition. They think that old methods are slow and can cause more hard work, so they don’t have time for tradition. 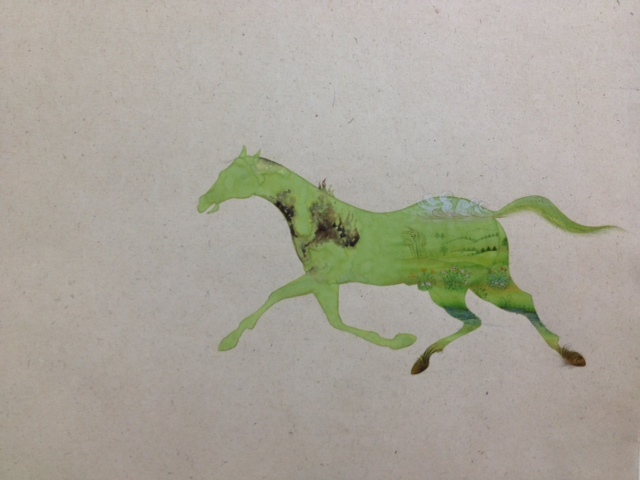 The horse in this painting is full of joy, seizing his freedom. 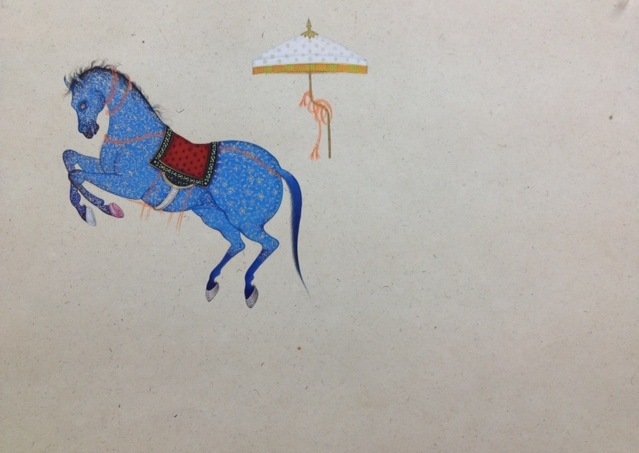 In the painting there is a parasol left behind the horse; this parasol symbolises traditional methods and care from parents. This horse is moving on his path to success. 5. Life (Invariable Loss of Parental Guidance), 2014. Stone and natural pigments, 35.5 x 40cm. The black and white horse represents one part of the present youth that has a very monotonous life. He is living the same daily life, doing the same activities and same job, with no time for others. This generation is getting lonely in their youth itself. This painting shows a fact of today’s generation: that he is very lonely due to his busy schedule. He is only bound to clock and duties. The painting is done in black and white. Even the image of the horse seems unbalanced, symbolising the youth lost in his busy lifestyle. 6. Tradition to Modernisation (From Traditional to Modernisation), 2014. Stone and natural pigments, 30.5 x 40cm. This painting states a transition from old to new. The image of the horse has been done in two different styles; one is realistic (front part of horse) and the other is traditional miniature style (rear part of horse). The wings are symbolizing new ideas, different from traditional methods. A person always needs change in his life as I have showed in this painting. While accepting new challenges, one also wants to preserve his old beliefs. 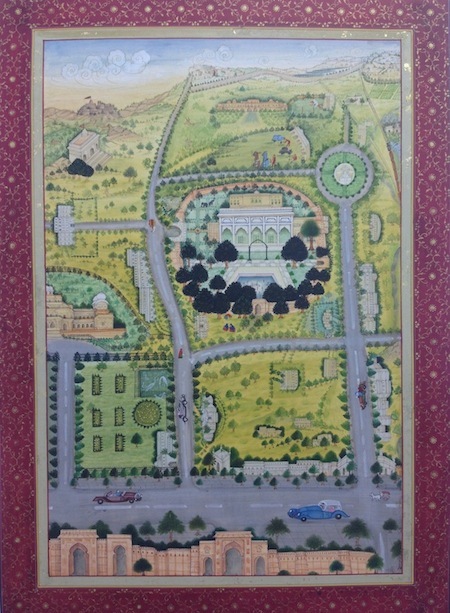 This is an original work created by Master Miniature Painter Ajay Sharma that depicts the city of Jaipur where he lives and works. His workshop and school is depicted at the end of the road after the round-a-bout on the top right hand side. Both stone pigments and a pigment formed from the sap of a tree that grows in the region of Jaipur are employed to construct this image. 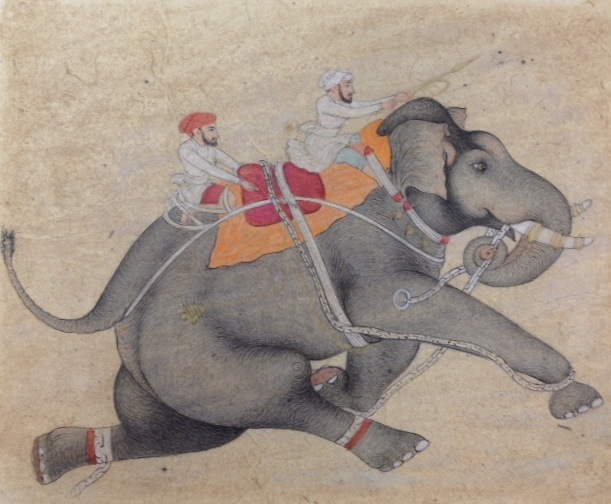 This original work combines both the detail of and departure from the miniature painting style of Rajasthan of which he is an expert. Portrait Lady, 2012. Stone pigment on paper, 11 x 9.5cm. Image credit: AirSpace Projects. Portrait, 2014. Pigment on paper, 21.5 x 16.5cm. Photo credit: AirSpace Projects. 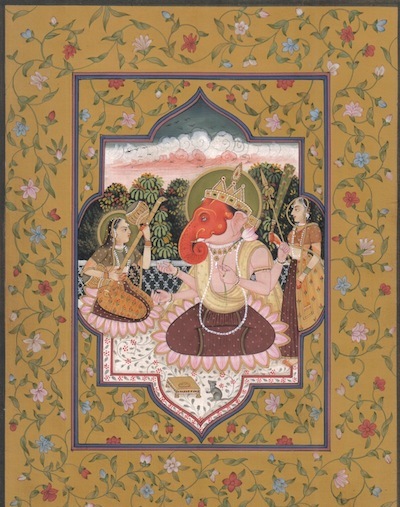 Ganesha with Wives Ridhi and Sidhi, 2013. Pigment on paper, 27 x 26.5cm. Image credit: AirSpace Projects. 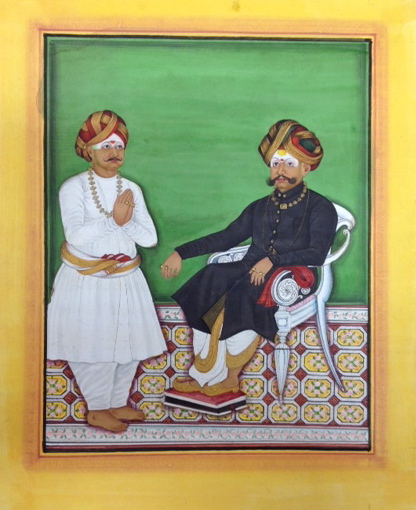 Maharaj Krishnaraja Wadiyar III, 2012. Pigment on paper, 26 x 21cm. Image credit: AirSpace Projects. Maharaja Dhiraj Singh, 2013. Pigment on paper, 21 x 16cm. Image credit: AirSpace Projects. Elephant, 2012. Sepia on paper, 13 x 16cm. Image credit: AirSpace Projects. 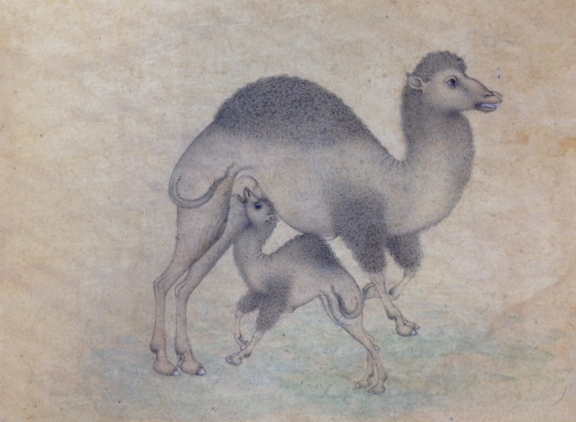 Camels, 2012. Sepia on paper, 16 x 22cm. Image credit: AirSpace Projects.